It seems to be increasingly popular to have food and wine pairings on your menu. I've tried these pairings before and they never really worked for me. So, I tend to ignore the advise and just order whatever I would normally want. Well, Food & Wine magazine's February issue has 50 recipes they pair with wine, beer, and cocktails. Even without the pairings, many of the recipes sound great, so I thought I would try the pairings with it. What I chose to make was a pork tenderloin and a salad (the salad had no alcoholic pairings). Season the pork with salt and pepper and dust with flour. In a medium, deep skillet, melt the butter in the olive oil. Add the pork and cook over high heat, turning once, until lightly browned, about 3 minutes. Add the onion to the skillet, cover and cook over moderate heat, stirring occasionally, until softened, about 10 minutes. Stir in the mustard and the 1 teaspoon of flour and cook for 1 minute. 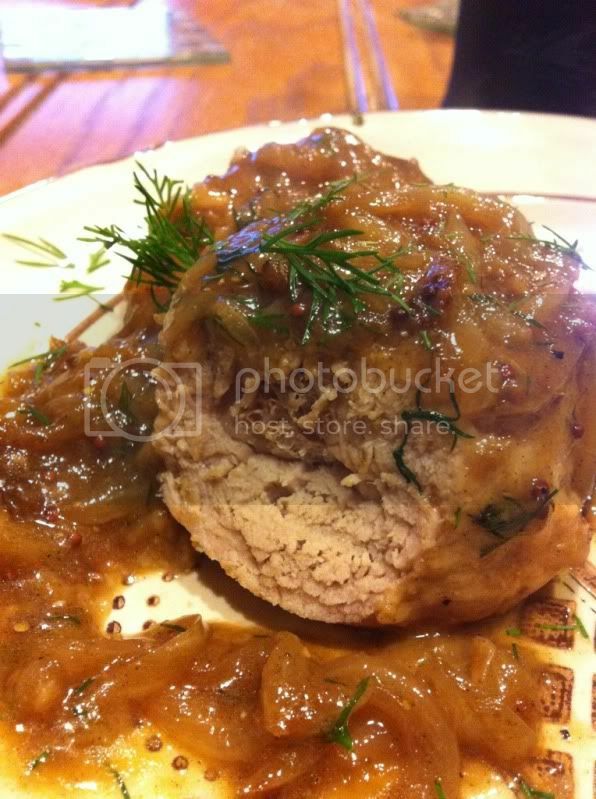 Nestle the pork in the onion sauce. Cover and simmer over moderate heat until the pork is cooked through, about 8 minutes. Transfer the pork to plates. Stir the chopped dill into the sauce and spoon over the pork. Serve with buttered noodles. - Suggestion of course. I usually just have it alone or with a side of cooked carrots. Surprisingly, both of these dishes take about the same time to make (about 30 min each). So I made the salad and my husband made the pork and we were done around the same time. One tip my husband taught me was how to preserve the dill and the chives. Take the bunch and and hold it together tightly by the stems. Put it in a brown paper lunch bag, upside down (stems facing up). Keep a hold of the bunch. With your other hand, grab the paper bag around the stems and rubber band them together. Take a knife and gently poke holes around the bottom of the bag.